James David Riggleman (born November 9, 1952) is the current Cincinnati Reds Bench coach, prior to accepting the Reds Third Base coaching job, Riggleman was manager of the Cincinnati Reds Triple-A affiliate Louisville Bats. He is a former Major League Baseball manager and coach. Riggleman was an infielder and outfielder in the Los Angeles Dodgers and St. Louis Cardinals minor league systems from 1974 to 1981. After his playing career ended, he managed in the Cardinals and San Diego Padres minor league systems until 1992, when he became the Padres' manager. From 1992 to 2011 Riggleman managed the Padres, Chicago Cubs, Seattle Mariners, and Washington Nationals, and also served as a major league coach with the Dodgers, Mariners, and Nationals between his managerial stints. His most recent major league managerial job was with the Nationals, a post he resigned from on June 23, 2011. Subsequently, he was employed as a scout with the San Francisco Giants. Riggleman was drafted by the Los Angeles Dodgers in the 1974 amateur draft out of Frostburg State University. He was assigned to the double-A level Waterbury Dodgers, where he played third base and second base. During the 1976 season, Riggleman transferred to the St. Louis Cardinals, where he was assigned to the double-A Arkansas Travelers and played in both infield and outfield. His career peaked at the triple-A level, which he reached in the Cardinals organization in 1977 and 1979. His career ended after the 1981 season at the age of 28. In 1983, Riggleman became manager of the St. Petersburg Cardinals, a class-A affiliate of the St. Louis Cardinals. He managed at the double-A level in the Cardinals organization—including with the Arkansas Travelers, the team which he spent most of his playing career with—and at the triple-A level in the San Diego Padres organization. Riggleman made his major league managerial debut with the Padres late in the 1992 season—after already managing a full season with the triple-A Las Vegas Stars—due to the late season departure of Greg Riddoch, and was retained through the 1994 season. In 1995 he became manager of the Chicago Cubs. In 1998, Riggleman's Cubs earned a wild card postseason appearance that ultimately resulted in a loss to the Atlanta Braves in the National League Division Series. Riggleman would manage the Cubs through the 1999 season. He then spent the period from 2001 to 2004 as bench coach for the Los Angeles Dodgers under manager Jim Tracy. Riggleman began the 2008 season as the bench coach for the Seattle Mariners under new manager John McLaren. He was promoted to interim manager upon McLaren's dismissal on June 19, 2008, but was not retained by the Mariners after the season ended. Riggleman was named bench coach for the Washington Nationals for the 2009 season, and was promoted to interim manager on July 12, 2009 following Manny Acta's midseason dismissal. Riggleman picked McLaren as his bench coach. Jim Riggleman hired Burton Rocks as his agent and he negotiated his managerial deal with the Washington Nationals in November 2009. He was retained as manager for the 2010 and 2011 seasons, but on June 23, 2011, he resigned as manager of the Nationals after a win against the Seattle Mariners and after the team won 11 of its previous 12 games. Riggleman was unhappy that the team had yet to pick up his contract option for the 2012 season. He said he told team management before the game that he "wanted to have a conversation" about his contract before the team left for a series against the Chicago White Sox, but "they didn't want to do that", so he offered his resignation. "I'm 58, I'm too old to be disrespected", he said. Riggleman was employed as a "special assignment scout" for the San Francisco Giants. For the 2012 season, he managed the Cincinnati Reds AA minor league affiliate Pensacola Blue Wahoos, ending the season with a 68-70 record. On December 12, 2012, Riggleman was promoted to manage the Reds' Class AAA team, the Louisville Bats, in 2013. On January 6, 2014, the Reds announced that Riggleman will return as manager of the Bats in 2014. 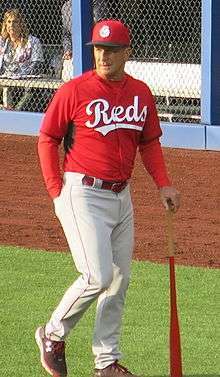 On November 10, 2014, the Reds announced that Riggleman will be their third base coach for the 2015 season  replacing Steve Smith. ↑ Sheldon, Mark. "Reds add Riggleman to coach third base". mlb.com. Retrieved 10 November 2014. ↑ "Jim Riggleman Batting Statistics". The Baseball Cube. Retrieved 20 November 2009. 1 2 3 "Jim Riggleman Minor League Statistics & History". Baseball-Reference.com. Retrieved 20 November 2009. 1 2 "Jim Riggleman Managerial Record". Baseball-Reference.com. Retrieved 20 November 2009. ↑ "Mariners fire McLaren; bench coach Riggleman takes over". ESPN. Retrieved 2008-06-19. ↑ "Manny Acta replaced by Jim Riggleman as Washington Nationals manager". ESPN. Retrieved 2009-07-13. ↑ "Jim Riggleman steps down as Nationals manager after Thursday's win". MLB.com. Retrieved 2011-06-23. ↑ "Jim Riggleman". Baseball Reference. Sports Reference. Retrieved September 29, 2015. ↑ Boren, Cindy (15 July 2011). "Report: Jim Riggleman hired by San Francisco Giants as a scout". The Washington Post. Retrieved 15 July 2011. ↑ Kilgore, Adam (4 December 2011). "Jim Riggleman will manage the Reds' Class AA team next year". The Washington Post. Retrieved 4 December 2011. ↑ "Jim Riggleman May Be Top Candidate for Cincinnati Reds Manager Position".